Israel Stiefel (1898, Odessa-1966, Tel Aviv; Chairman of the Democratic Caucus in the Senate of Pennsylvania; President of the Jewish National Fund, Penn-Seaboard Region) speaking at the 1956 dedication of the Stiefel Forest, in Jerusalem. Also pictured are George M. Leader (1918-; Governor of Pennsylvania) and Dr. Abraham Granott (1890-1962; President of Jewish National Fund). The forest honors the memory of Jacob Stiefel, his son Senator Stiefel, and his grandson Jay Robert Stiefel (1946-). 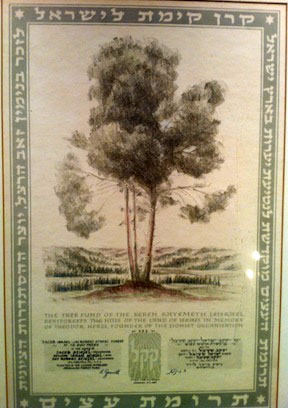 Jacob who was born in Pokatilova c. 1859; travelled to the United States three times, 1887-1895; returned to Odessa; and emigrated to Palestine in 1921. He lived in his villa on Levinsky Street, Tel Aviv, until his death there in 1929.